‘I don’t work for my image, I work for this club. How I look is not really my problem,’ says the Gunners boss. 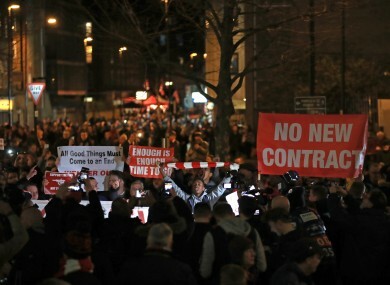 Arsenal fans protesting outside the Emirates Stadium before their Champions League exit this week. ARSENAL MANAGER ARSENE Wenger will take into consideration the views of angry Arsenal supporters when he decides whether to remain at the club beyond the end of this season. Wenger endured calls for his resignation before and after Tuesday’s humiliating 5-1 defeat against Bayern Munich in the Champions League. The Gunners’ heaviest home loss since 1998 ensured their seventh successive last 16 exit from Europe’s elite club competition, sparking furious protests from supporters. It is not the first time Wenger has been subjected to vitriolic abuse in recent years as the Frenchman’s failure to build a title-winning team since 2004 continues to frustrate fans. Wenger, who has been in charge at Arsenal for 21 years, is yet to confirm he will accept a reported two-year contract extension and speculation has grown that he will quit when his present deal expires at the end of the season. With Arsenal’s Premier League title challenge in tatters, the 67-year-old plans to contemplate his future a while longer and the fans’ opinions will play a small role in that decision. Asked whether he would consider the crowd’s displeasure when deciding his future, Wenger said: “Yes — you consider. It is not the most important factor to consider of course. “I don’t work for my image, I work for this club. How I look is not really my problem. “I have shown since I have been here, I have shown I love this club and am loyal to this club. “I think I have made the right decisions and respect the values of this club. Arsenal winger Theo Walcott had hinted this week that there was some unrest amongst players and staff at the club. Walcott’s comments followed on from reports of a training bust-up involving Arsenal forward Alexis Sanchez and his team-mates after the Chilean was surprisingly dropped for last Saturday’s defeat at Liverpool. Wenger brushed off talk he has told his players he is leaving soon and insisted his team still has a strong bond. “I think a lot has been said about that is exaggerated,” he added. “We have a good united group in terms of the group. “In the past it’s not always the team that love each other the most that are the best on the pitch. “When you go through disappointing results you have disappointment, but the best way to respond is to show how united we are on that front. Amid claims Alex Oxlade-Chamberlain will ask for a transfer in the close-season, Wenger said of the England midfielder: “I hope he stays here. He is a very promising player. Wenger had strongly criticised refereeing decisions that went against his side in the Bayern clash and he continued to insist the controversial dismissal of Arsenal defender Laurent Koscielny, for conceding a penalty when the Gunners led 1-0, was the turning point. “It’s easy for me to assess the game because we watch and analyse it and I think overall at 11 against 11 we produced a top-level performance,” he said. With non-league Lincoln visiting the Emirates in Saturday’s FA Cup quarter-finals, Wenger will know the expected victory over inferior opponents will do nothing to silence the critics. He could be without Danny Welbeck and Alex Iwobi due to the sickness bug that forced Welbeck to pull out jut before kick off against Bayern. Email “Wenger will consider angry fan protests when deciding if it's time to leave Arsenal ”. Feedback on “Wenger will consider angry fan protests when deciding if it's time to leave Arsenal ”.